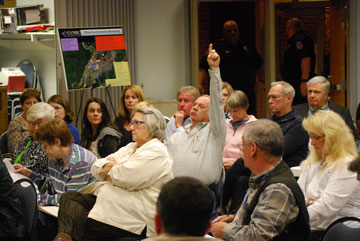 The NRC hosts hundreds of public meetings each year. For the most part, these meetings go well — discussions take place, participants get what they need, and the parties move forward with plans and actions. From time-to-time, though, NRC staff members need some help to make a meeting successful. In those cases, an NRC facilitator may get involved. An NRC facilitator is a specially trained NRC employee who acts as a “neutral” and whose main purpose is to make sure meetings are successful for all participants. This can mean anything from helping set up a productive agenda to making sure the public knows about the meeting to ensuring all meeting attendees have a chance to participate to rephrasing something someone has said to help people understand each other. Facilitators are there to represent the process of the meeting and to do what they can to assist all participants. Can it be a challenge working for the NRC and yet acting as a neutral during an NRC meeting? Definitely. Acting as a neutral means in some cases you are helping NRC staffers get their point across and in other cases helping members of the public get their point across. There have been plenty of meetings where I have found myself devoting my energy to trying to get the NRC staff in attendance to understand the excellent point a member of the public has (in my opinion very clearly) made. Good communication takes hard work, and when the topic is as complicated as nuclear regulation and you throw in some emotion on top of that, it can be even more challenging. A good facilitator can make the communication process a bit easier on everyone. There is always room for improvement when it comes to our public meetings. Facilitators can go a long way to ensuring meetings are productive, but it’s your input that really helps us focus on what aspects of our public meetings needs improving. You can help us by always filling out a public meeting feedback form after an NRC public meeting and providing the form to an NRC staff member or dropping it in the mail. We are currently taking steps to improve that form and to make filling it out easier (as in electronic). If you have some feedback, we can also take it here as a comment. Please be sure to let us know in your comments (here or on the form) if a facilitator was involved, and how he or she did. I have been in the commercial power industry for 20+ years and have worked closely with a variety of NRC inspectors over the year. I can assure you the NRC is keenly interested in public safety and not at all concerned about convenience. They always do great work. And as discussed the task of any moderator were always challenging as he has to gathers everyone idea and make sure everyone thoughts get clearly aired. I have in years past requested an electronic form for members of the public to evaluate NRC meetings, so thank you for that. The concept of “a neutral” is logical and a good first step toward more productive meetings. But in order to convince the public that this new approach is more than a public relations effort, the NRC will need to also follow through. When the agency gets useful input, it needs to STUDY IT and TAKE MEANINGFUL ACTION if it wants to convince the public that the NRC ranks public safety as more important than corporate convenience. Lance, as a former Markey and Reid advisor, your Chairman is not “neutral”. Do you have any idea what a pall that, and his decisions, casts on what was once the absolute best Federal aganecy? NRC emploees have vested interests. Past experience with city facilitators was one of city cop control. Select your facilitors from neutral components of University Engineering and Science Departments and obtain integration with with respect. Previous Previous post: The AP1000 is certified – Where do we go from here?